Envirogard's DFU's are highly versatile dust filtration units equipped with HEPA filtration, and capable of moving between 600m3/hr and 5400 m3/hr of air. 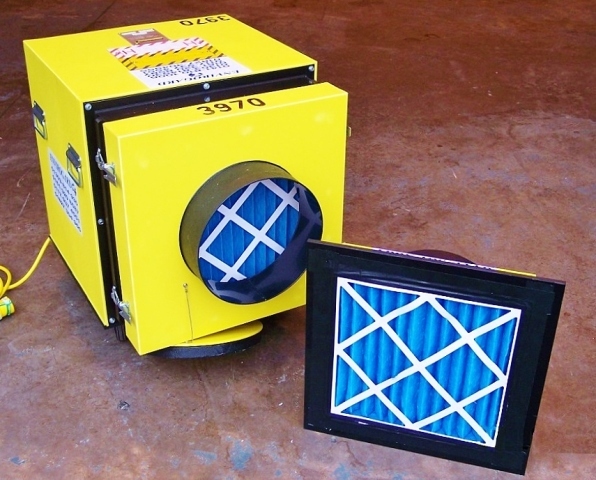 They can be used stand-alone as air scrubbers, for spot extraction to capture dust generated at source, to extract from an enclosure and provide negative pressure, or to ventilate areas using filtered air. Whichever application they are used for the air passes through a HEPA filter and the machines are all regularly tested to ensure they remove 99.995% of particles as small as 0.3 microns (to put that in perspective that's a particle approx 1/3000th the size of a pin head). As standard they are supplied with a pre-filter hood which can be fitted direct to the front of the machine, or this can be used with an intervening ducting as a "roving" collection hood. For difficult applications - where there is a high dust load - the larger machines (2300 and 5000) can be equipped with a pre-filter unit containing bag-filters; these are quick and easy to change within a matter of seconds and can collect larger quantities of dust between filter change. As with all our equipment these machines are "roll-up, plug-in, switch-on"; they are simple to operate and run on a 110v power supply. Their use is easily scaled up or down by selecting more (or fewer) units of the same model, or by choosing higher or lower capacity units from the range. All our hire equipment follows a "roll-up, plug-in, switch-on" philosophy - we keep it simple. Everything is easily scalable - you can hire more [or fewer] units of the same type if the scope of your work changes, or you can switch to models with a larger [or smaller] capacity - as suits you. 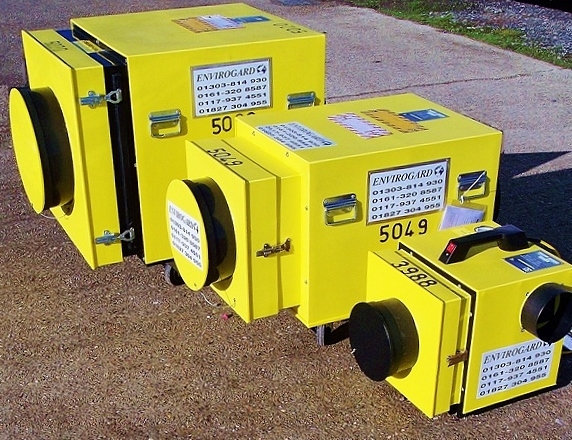 All our equipment is "plug and play" - it operates on 110v (either 16 amp or 32 amp) - and we can provide suitable transformers if you don't have your own. We provide straightforward, easy to read instructions with all our equipment, and we are happy to arrange for equipment to be demonstrated at one of our depots. Finally - we DON'T commit you to a long hire. As standard this equipment can be taken on a 1 week minimum hire - with any additional time being charged per extra day - when you hire direct from us under our conditions of hire. We also offer special rates for shorter duration hires of less than a week. Click on the above images for a handy summary of the sorts of air handling and specialist vacuum equipment we hire out, and the contact details for our depots - which provide a service across mainland U.K.